As you may (or may not be) aware, fat packs are a hard commodity to come by these days. It really pains me to write this but Battle for Zendikar has only been out for a week and it seems like every local game store is already out of stock of BFZ fat packs. Umm… wow! That is some serious demand for full art lands. The first pieces of evidence to stream in to Reddit include this posting, which stated that all sealed BFZ product for the player’s store was already out of stock. This by itself isn’t concerning since some stores pretty much always sell out of product quickly, especially if the store is smaller and there just aren’t many places around the area to buy product on release day. Next up we have this account from another player about how the store sold out of preorders almost immediately for fat packs, and that the store was actually telling people to buy the fat packs at big box Target and Walmart since they didn’t have any in stock and couldn’t order more. This is just so crazy, since the players were willing and ready to keep spending money at the LGS, and now that business has gone away from the LGS and spent at the big box stores. This shortage of fat packs boils down to the fact that Wizards only does one print run for fat packs – and this is how it has always been done in the past. Once that first print run has been sold out, there are no more to be had. This is why Zendikar fat packs are so crazy expensive. They are all first print run, which means that if you want to still try and play the hidden treasure lottery the fat packs give you a legitimate chance to pull a hidden treasure since all the fat packs are guaranteed to contain first run packs. It has gotten so bad that Deriums, a store that has a huge online presence and is closely connect to the Magic community, has gone out of their way to explain why fat pack prices cannot (and most likely will never be) MSRP prices at local game stores. It all started with this video that Deriums put up on Reddit explaining why the fat pack prices are going to stay at $55 or higher MSRP as your local game store. Of course, as the post aged more and more users were calling Deriums out as justifying a price hike (or even claiming outright greed) by overcharging their customers for a currently hot product. However, Deriums quickly responded to these criticisms by showing evidence that Wizards has already taken the fat packs off of the product reorder list in their restock emails to stores and distributors. In the usual Deriums style, he says that if you think he is lying to you or scamming the community that you should report him to Wizards. He stated that if he was on the other side of the fence that he would do the same thing if he thought a store was price gouging by lying to their customers about the availability in order to increase the price. 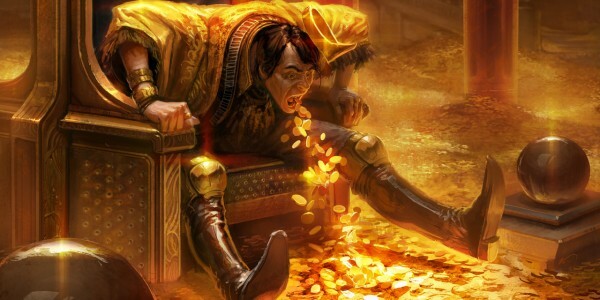 However, his thoughts were about the CURRENT information we have about fat packs in the past – if you recall, Wizards was able to add more Mind Seize decks in later shipments of Commander 2013 print runs due to an outcry from players looking to pick up (at-the-time) Legacy staple True-Name Nemesis. We’ll probably be seeing the same type of response from Wizards for BFZ fat packs, since the demand is clearly, CLEARLY there for fat packs and players should be able to buy them from local game stores and support their community. Right now, it is a choice between two evils – do you knowingly price gouge yourself and support your LGS, or do you get the fat pack for MSRP but buy from the evil corporation? Let’s go over two of the counter-arguments for not price gouging yourself. We’ll first go to Tolarian Community College, who released last weekend his fat pack review for Battle for Zendikar. It gives great coverage to the fact that for MSRP $40 the fat pack is worth it, at least compared to past fat packs that didn’t contain full art lands. The Professor also spends a great amount of time going over that the land pack will only cost you $12-$15 if you get the lands separately, whether it is through TCGPlayer or Pucatrade (20 to 30 Pucapoints per BFZ full art land). So if you’re looking to buy a fat pack for the lands, it’s better just to pick them up individually or just get them slowly over time through drafts. He also pointed out the Star City Games and Channel Fireball are both charging $60 per fat pack, and we all know that many LGS’s go by SCG or CFB prices (but did not add that there was only one wave of fat packs released, which is why the price is so high). In the end, he actually advocates buying through Target or Walmart for this product (he never does this, by the way, so I was very surprised to hear him recommend this) if your LGS won’t budge on price. Second, MTGHeadQuarters released an angry video about local game stores selling fat packs above MSRP and how it is wrong to price gouge your customers so much. His argument is that even though there is a ton of demand, local game stores shouldn’t over price the fat packs to meet market demand. “LGS stores that are doing that, right here (middle finger to camera)”. He states that local game stores are not charities and we are not obligated to spend extra money there just because it is a local game store. I could go on about what MTGHeadQuarters is saying but I think the reply by Markus Wade in the comments section of the video (after clicking on the link, pause and scroll down past the video and you should see LINKED COMMENT expand that one to read Markus’ replies) does such a great job covering the counter points that I’m just going to briefly talk about what Markus said. Markus argues (and I agree) that Youtubers and others in the community just don’t understand how rare fat packs currently are – however, like Deriums says if they change this and release more fat packs, the price of the fat packs is going to lower overall considerably over time. However, if Wizards comes out with a statement indicating that they aren’t releasing fat packs for BFZ ever again, I would expect that the high demand for the land packs is going to keep the fat packs up in price at local game stores for the foreseeable future, since as Markus states mostly casual players support local game stores and they aren’t going out of their way to find the best deal on fat packs – they’ll see what they want in the store, and just go ahead and buy it. So, what conclusions can we draw from this anecdotal evidence on Reddit and Youtube? Well, clearly there are plenty of stores upcharging on the MSRP price of the fat pack, but at the same time those stores give pretty good reasons for charging the higher price. Ultimately, I’m on the side of TCC on this one but will add my own two cents. Right now, it is best to buy the fat pack from Target or Walmart because it is the easiest way to get one without paying an arm and a leg. However, let’s not call the game stores greedy, or say that they price gouging customers. There is real demand for this product, which we saw coming but never thought about the fact that we were only getting one wave of fat packs. Those of us that read websites like MTGPrice are clearly looking for the best price of both singles and sealed product, and laugh at people paying $60 for BFZ fat packs. Yet like Markus indicates in the comments of the MTGHeadQuarters rant, casual players are happy to buy the fat packs from local game stores because that is the easiest way for them to get their product. It also additionally supports the local game store for those that want to “give charity” for all of those unsold Fate Reforged fat packs and razor thin margins the stores make on booster boxes. Even I didn’t realize fat packs were similar to products like From the Vault and Modern Masters (I’m referring to the first Modern Masters here), where only one wave is released and the market dictates the price. I expect Wizards will be releasing a statement on BFZ fat packs in the near future since many players want a pack of the full art lands, so I’ll be following the fat pack craze pretty closely. My prediction is that they are going to release another wave of these things based on demand, just like they did with Mind Seize in Commander 2013. If you want to support the local game store, go for it – nobody is stopping you. Just realize that the MSRP for the fat pack is $40 and you shouldn’t be paying much more than that for full art lands since the price of those lands is going to come down drastically over the next several months as players open what is probably going to be the most Magic product in the history of the game so far. Thanks Expeditions! I’ll end with saying that history indicates fat packs are great speculation targets at MSRP. Fat packs are great money makers in the long term, with more proven ROI than booster boxes. This will be true for BFZ as well, even if another print run is released due to the full art lands. I’ll be looking to pick up a few extra of these but certainly not at LGS marked up prices. Keep a lookout for another run of the fat packs in the future, and in the meantime check out your Targets and Walmarts to see if you can get one or two extra to stock away for future profits if your LGS is currently overcharging for fat packs. What does everyone think about the current fat pack craze? As usual, let me know in the comments and thanks for reading. ABUGames is selling them for MSRP. Wow, now that is crazy haha. It is ridiculous right now. Things like this make me want to just stop collecting all together. I am not about to play the greed and glut game… and this is the second time in less than a year that this type of thing has happened. i just lol when i hear people buying fat packs for 60 and claiming they just walked away with 80 dollars in lands. they fielded a lot of calls looking for fat packs from random folks this weekend that had never been to the store before. they sell msrp or lower to regular players for FtV and commander products, but typically match market prices after the pre order window. I didn’t know you were going to write such a length article about the subject. I see similar problems and my view point comes out tomorrow. I don’t really know if there is a blame game to be played here but my opinion is this is not the LGS’s fault. Agreed, sorry to steal some of your thunder! I will definitely read your viewpoint as well because we haven’t seen a craze this like this for new sealed product in quite some time. It’s going to be interesting to see how Wizards responds to this. I’m willing to bet WoTC does another print run. Plus, real value isn’t today its 3+ years out. People walking with immediate value are those just lying to themselves. Enron used to do the same thing, mark their inventory to future prices, people doing that with lands and everything else are all crazy. The real investment is buying for today so you don’t pay more in the future. All the LGS around me sold out first day and were selling anywhere from $5-$20 more. I also think it is highly probable that they do another print run because we know they are agile enough based on the whole Mind Seize situation. If they’re agile enough to change an existing product and ship more out, for fat packs I can’t see how it would be much different. I mean, Wizards is also leaving money on the table by not making more too! If they don’t release more fat packs it is a losing situation all around. My LGS sold them at midnight for $35 limit 2. Great deal. Other LGSs near me sold them for more than msrp. It all depends. I do think that if WotC said that due to overwhelming response from the full art lands that ALL lands in future sets would be full art this would break the stalemate slightly. I’m not sure the reason why they wouldn’t do this. Sure it would make current full arts not so impressive, but what do you need a text box for a basic land? The “Golden Ticket” is really ruining the set for me. I really wished WotC would have found a different way to get these out. I have pretty high confidence that they’re not going the full art land route for all future sets. They believe it is part of what makes Zendikar special – the land matters theme. This is why we get full art lands in the first place, to celebrate the fact that in this block the lands matter so here’s a special treat to showcase them. I think the best way to correct this is to make more BFZ fat packs before Xmas, even if it is a pain for Wizards to do so. Unfortunately, it went nuts at release this time because players have been itching for a chance to pick up a bunch of full art lands on the cheap and the fat packs enable them to do just that (at least right now, before future supply starts lowering the current prices). I agree with you on this, but do you think that the amount of things needed printed for a fatpack might cause them to look for other solutions? An edh deck would be easier to reprint than a fatpack imo. Interesting theory, putting full art lands into this year’s EDH product would certainly surprise me! Don’t think it’s going to happen though since full art lands are “special” to Zendikar because the block is based around the land matters theme. Everyone is sold out around me (Chicagoland). You can’t find BFZ fat packs for ANY price at ANY LGS or big box store. All of their supplemental products for BFZ should have full art lands. Then all of it would be flying off the shelves. Intro packs and all. This is out of hand. What if WoTC does a 2nd print run with regular lands instead of full-art? Would people still buy for expedition lottery ticket access? Or are those in the first print run only? Expeditions are in all BFZ product that will ever be made, so that’s not really a valid reason from a financial perspective to pick up future fat packs. Yes, which they are going to do since Worldwake also had full art lands in packs and I also believe in fat packs. So expect another wave of fat packs with full art lands to come when Oath is released. Jared, I bought six fat packs hoping to keep and sell in 3 years to spec on. What is your guess on their value at that time? I have been picking them up at MSRP. I’m new to the finance side, was this foolish? Not foolish at all if we’re looking long term. When we look at past fat packs my guess is that BFZ fat packs will definitely be worth over $100 at that point. Innistrad fat packs currently go for $130 to $150 BIN on eBay, and I can’t imagine that BFZ will be any less desired in the long run even if another print run was commissioned by WoTC. Hats off to you sir for picking up six of them, and enjoy your profits in three years. If you have a hobby shop that sells sports cards as well as mtg in your area, they might have fat packs for MSRP. Luckily for me there’s one 5 min. from my house, and they had some for $40 so I bought 2. Owners of these type of shops make there money more from sports cards and don’t care if these fat packs might be $100 in 3 years. My upsetting experience in regards to BFZ fatpacks has been with online retailers/ebay. Now, I know that you run risks, but to date I’ve never had issues with ordering cards from either place. With the fatpacks, however, I have yet to receive a single one. I preordered/ordered 4 total from 3 different sellers at MSRP or slightly less than MSRP, and by the time it came to actually ship them, the prices had jumped and the sellers just canceled the orders or refused to send them, forcing me (and dozens of others who ordered from them) to take it up with ebay or paypal. I’ve never had this issue before with any product, but this has been just silly. If it was one guy I could see it, but 3 different sellers all did the same thing. Scrounged one up at Walmart and another at my LGS for a little over MSRP, but that looks like it’s going to be all I do for fatpacks. As an addendum: I don’t really have an issues with an LGS charging more for the product due to demand, as long as they’re straightforward. The issue I have is with pulling/not honoring sales, deals or advertising in order to hold off selling in order to sell at a spiked price. We all have to deal with that when we sell cards, everyone has had experiences with selling a card and then watching it spike later, just comes with the territory. Top Deck Games in Westmont, NJ (near Collingswood), online site is CardTitan.com, Owner is Nick Coss…Facebook him. They host Eternal Weekend in Philly (with other contributors I believe). Top Deck (and Mr. Coss) sold fat packs at their usual $40 pre-order and had no limit. As usual on release weekend (not pre-release) he had his Fat Pack Challenge where players buy and open a fat pack and build a limited deck for prizes. What are the prizes? 4-0 record wins 2 fat packs, 3-1 wins 1 fat pack. What is the cost of entry? $40!!!! You get to play for free and win prizes for the price of a fat pack! This set was the first time he wasn’t able to offer Saturday and Sunday events but he still had one. He/the store does this every set release. Now I understand not every store can do this and Top Deck Games is a major retailer and they always have product, but not EVERY store jacked up the price…but this is supply and demand and I don’t blame anyone for increasing the price. Is Tarmogoyf good? Yes. Is it $100 better than Scavenging Ooze, Lightning Bolt,Tasigur, or even Delver of Secrets? Probably not, but it’s all about Supply and Demand for the cards. There’s as many Underground Seas in the world as there are Plateaus but their price is pretty damn different. I’m not sure why people don’t understand this about this fat pack release and about the cost of items in general. Also, and I find this extremely funny, there’s 9 packs plus the 40 land pack in a fat pack that’s $40. So let’s say it’s $50 for a BFZ fat pack, and the price of a booster box to make things simple is $100. For a Booster box you would get 27 extra packs but 13 less and randomized basic lands for only $50 more than a fat pack. So buy a booster box for just double the fat pack price and trade one of the 27ish extra rares you open for 13 or so full art BASIC lands you need. And buying a booster box for double the fat pack price gives you 4 times the chance of opening an Expedition land (you open 36 packs instead of just 9). So you have to spend $160 MSRP on fat packs to open an Expedition land at the same rate as a booster box. Is the extra “$60” cost worth it for all those full art basics? If you say yes, then you have a real argument. I would still recommend drafting 2 or 3 times and trading people for the full art basic lands you really like or pay an few extra dollars so you don’t have to search for lands. From an investment standpoint I picked up a case of BFZ Fat Packs. They seem to be the only things that usually goes up in price over time these days even though Dragon’s Maze, Born, and Journey Fat Packs do not seem to be increasing in price. I kinda hope Wizards doesn’t re-release BFZ fat packs cause my investment potential declines a lot. I do hope and think the full art basics show up in Oath, and wouldn’t be shocked if there was more new art work. I have a close judge friend who speaks nothing but praise of Nick Coss, and your own experiences go even further to show what a great guy he is. I hope he continues to be an excellent pillar of the community in the years to come, as I’m sure his fat pack handling is only one of many things he’s done over the years to make MTG better for everyone. Not a single store in my areas is selling them for higher then MSRP. In fact I would go as far as to say that any store that does is price gouging and is taking advantage of a negative situation. I’m based in Sydney Australia, my local store sold out of fatpacks in the pre order stage. They typically sell for $60 AUD ($42.6 USD) but my local store let us get a booster box and fat pack combo for $200 AUD ($142 USD) on pre order. Our booster boxes retail at around $165 AUD normally so the combo is a pretty good deal. That’s actually pretty reasonable for Australia, since I feel like even digital services are price hiked for guys just because… Australia! Glad that Wizards is able to get you guys product without having to upcharge based on shipping, distance, etc. I’m based in Melbourne Australia – I managed to pre-ordered 9 fat packs very early on for $40 Aud (~30 USD) at a local LGS and they honoured it even though they were preordering for $55 Aud. Kind of help withy massive order of 9 cases (shared amongst friends) for $800 aud (560 USD) per case. I was lucky enough to get my hands on 5 Fatpacks. There was no way I was able to keep myself from digging for Expeditions, so all were opened, but I did keep the landpacks from all 5 of the fatpacks factory sealed in anticipation that they might become an in demand commodity in the future. I have a feeling that Full Art BFZ lands won’t go down drastically in coming months, even if it is the most opened set ever. These basic lands aren’t a ‘4 of’ kind of card. People can literally stock up as much of them as they want and still hold a value to them. Plus, they know old Zendikar lands are priced very moderately at $2.00 each. That alone is enough for people to hold their prices on BFZ full arts. Not sure about that. Yes, original ZEN full art lands are currently around $2 for the hottest ones, but that can’t hold, now when hundreds of thousands of full art lands are about to be dumped onto the market over the next six months if we include Oath as well. I mean, I’ve seen crazier things happen but for in-print lands that you can get out of a booster pack (for basically $1-$2 more, why not just buy a pack lol?) I don’t think they are going to be $2 each. One thing I haven’t seen mentioned at all here, and it does come into play with an LGS. Let’s take FTV:20 as an example. MSRP was $39.99 if memory serves me correctly. It was slightly more expensive MSRP because it came with 5 additional cards that year. On eBay these things spiked when Jace was spoiled to over $400 for a couple days. After release they were about $140 on eBay. It would be silly for an LGS to sell these at MSRP after release. Everyone would just buy them and flip them on eBay. The LGS would make next to nothing (margins on Magic are not very good) and whoever bought them could immediately flip them for huge profits. Great points. Not that I’m defending LGS’s that are charging $70 or higher for a fat pack, but I do think some game stores have a Batman mentality here with upping prices to become the villain. You either die a hero (sell out quickly to just a few individuals) or live long enough to see yourself become the villain (keep fat packs, but they need to be super high priced to still be in your store). I just wanted to share that I have had decent luck finding BFZ Fat Packs at Shopko today at MSRP. All the LGS, Walmarts, and Targets have been wiped clean but somehow Shopko has flown under the radar with a decent quantity in stock. Also haven’t checked K-marts but they do typically carry trading cards, not sure if they carry MTG but it may be worth a look. Don’t give in to anyone charging more than MSRP! Best of luck! LOL There is no shortage of these at all. There is 3 Walmart’s in my area. I was at 2 of them today. One store has 4 the other has 6 fat packs. So I’m not sure where this “shortage” is coming from. It’s all a marketing scheme that everyone has fallen for…..just depends on whether or not you fell for it.